On the CBS The Inspectors episode titled “Window Washers,” Amanda (Jessica Lundy) sought to capture a check washing ring in New York. When Preston (Bret Green) went to New York to house sit for his Uncle Kevin, he inadvertently discovered the ring was operating from the office building across from Uncle Kevin’s apartment. United States Postal Inspection Service- Inspector Training, Washington, DC. Georgia (Charmin Lee) is instructing the trainees including Preston on a procedure that is becoming a growing crime epidemic: check washing. “Check washing is a technique used to clean all the ink off a paper check like it’s never been cashed. Criminals use a special chemical solution so that it doesn’t damaged the paper. And the washed check simply hangs out to dry,” Georgia explains as she shows them how check washing is performed, “And the perps can write in any amount made payable to anyone they choose.” We see check washing being done at an office building as Georgia is giving her demonstration. Georgia talks about how well the checks are washed that even the banks can’t tell they’re not real. “And the criminals are never caught?” Preston asks. Georgia answers that’s where the postal inspectors come in. Next, we see a video conference with Inspector Vince Marshall (Gary Weeks) from New York. He tells Amanda and her team that he’s investigating a check washing ring there is New York. He’ll need Inspector Wainwright to come down to The Big Apple to assist. Meanwhile, Preston is packing a bag because he is going to New York to house sit for his Uncle Kevin. He receives a call from his mother in which Amanda says that since they are both going down to New York, they can be travel buddies. So much for a quiet train ride. On the train, Preston is trying to watch on his cell phone a Hitchcock movie Noah suggested while Amanda is talking. She asks whether he is watching the movie with the birds. Since his mother’s conversation is distracting, Preston decides that he’ll wait until he gets to Uncle Kevin’s place to finish the film. Arriving at Uncle Kevin’s apartment is New York, Preston talks with Veronica on his cell phone (voice of Erica Marie Sanchez, who doesn’t appear in the episode) and tells her that the apartment appears to be under some sort of renovation as there are sheets everywhere. He notices the pictures of birds the dress the walls and comments that Uncle Kevin is a good photographer. Unfortunately, there isn’t a television at the place. “I guess you’re going to have to entertain yourself for a change,” says Veronica on the other end of the line. Preston says that the people there must live in a fishbowl as no one closes their window blinds. Veronica reminds that anyone that he can see can see him too. He sees a guy in a three piece suit doing tae bo and men in an office building working the swing shift. Veronica sarcastically comments that she’s glad he went to New York to watch movies and spy on people. Preston finds a note for him from Uncle Kevin. It reads “Hey Preston, Thanks again for looking after the place. The electricity is a little spotty because of all the work they’re doing. Don’t be alarmed if the power goes out. Talk to you tomorrow. Uncle Kevin.” Preston tells Veronica that he’s going to turn his phone off to save the battery and will call her in a little but. The lights start flickering and since his phone’s battery is running low, Preston decides to watch ‘reality television.’ He goes to the window and looks out. His eyes catch activity in the office building. Preston grabs Uncle Kevin’s binoculars to get a closer look. He sees a man take a check out of a file folder and another man wearing gloves and goggles pour solution into a tray. “No way,” Preston says can’t believing that he’s watching check washing taking place. He rushes to his cell phone. With only 10% of battery remaining, Preston manages to reach Inspector Marshall and gives the address of the office building before his phone dies. Later while meeting with Amanda, Inspector Vince Marshall tells her about the strange phone call he received. As it unnerved him, Inspector Marshall decides to send the authorities to check out the address he was given on the call. Meanwhile, Preston continues to spy on the check washers. Unfortunately, he is spotted watching them! Preston calls his mom. But Amanda is in a car that is driving under a tunnel with Inspector Marshall at the time and misses her son’s call. But Preston left a voicemail. Preston is able to rig up a makeshift battery charger that works temporary. The electricity also comes on briefly. Preston calls 911 and is told that the police are on there way as they got a call about the address earlier. Preston grabs his binoculars and watches as the police arrive at the office building. But the clever perps are able to disguise their illegal activity so that it appears to be a call center. The head of the check washing operation points at Preston. He’s in big trouble and in danger! When Amanda’s cell phone is fully charged, she plays her voice mail. She calls Preston and he tells her about the check washers. Then, Preston tries to leave Uncle Kevin’s apartment but is unable to escape. When the head of the check washers pounds on the door, Preston grabs Uncle Kevin’s camera and hides under a sheet to appear to be a piece of furniture. The man bursts in and talks about how people who don’t mind their own business wound up hurt. When Preston moves from underneath the sheet, the man discovers him. But Preston directs the camera’s flash in the man’s eyes. Amanda and Inspector Marshall arrive in the nick of time! Amanda tells the check washing perp that the next time he goes after a teen, he should make sure it’s not the son of a postal inspector. As the episode concludes, Preston admits to Amanda that he got way over his head this time. 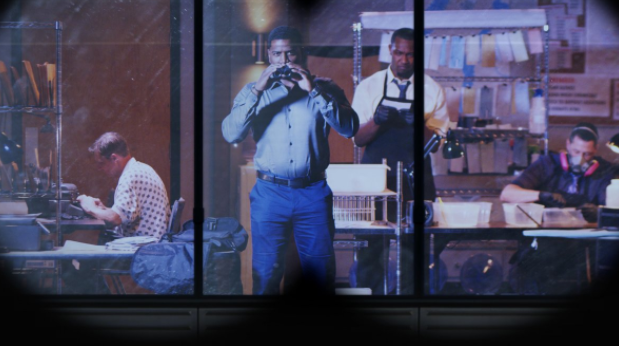 CBS’ The Inspectors episode “Window Washers” focused on the crime of check washing and how postal inspectors seek to stop the perpetrators.